On January 24th, in a decision of 5-0-3, Howard County School Board members adopted a resolution to endorse the Black Lives Matter At School Week of Action. “This act reminds Black students, families, and staff members that they are seen and valued at the highest levels of school governance. Although it is clear that there is more work to be done, this vote is an affirming step toward equity in out county” said Jessica Nichols, a Social Studies teacher at River Hill High School. Jessica was one of several Howard County residents, parents, and retired teachers, who gave powerful testimony in support of the resolution. The resolution was introduced by Mavis Ellis, the first African American chairperson of the Howard County School Board. The resolution was drafted by Black community members and non-black allies. The local educators’ union, the Howard County Education Association (HCEA), has yet to endorse the week of action. HCEA endorsed candidates for school board, Vicky Cutroneo, Jen Mallo, and Christina Delmont-Small were the abstentions, citing “process issues” as their rationale for non-support. The resolution allows educators and students to participate in events and instructional activities for the week of action without fear of repercussions; and solidifies the county’s commitment to fostering a school system where Black students’ lives matter, and where our Black students, educators, and their families are treated with respect and dignity. In addition, pre-K through 12th grade teachers of all content areas will be encouraged to teach a developmentally appropriate, culturally relevant and responsive curriculum, starting with the week of action and continuing throughout the year, that uplift and affirm Black lives and Black identify. 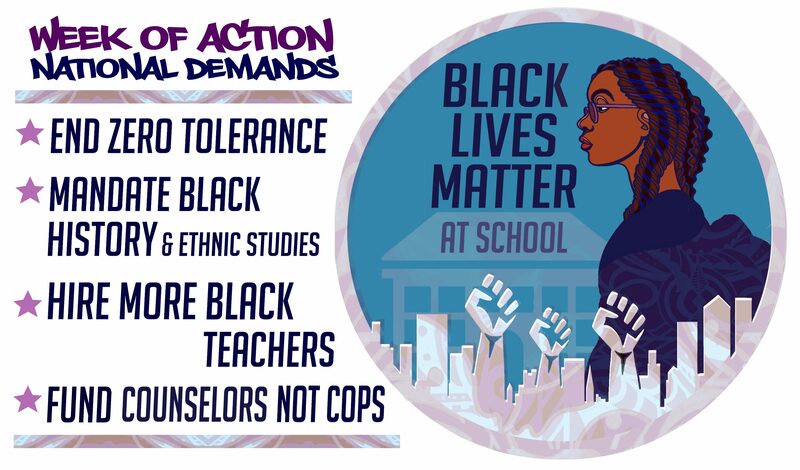 The current plans for the week of action were developed by a local committee of students, parents, educators, and community members and will be related to the four demands of the Black Lives Matter at School Week of Action. Among the planned community events will be a workshop on Zero Tolerance, School to Prison Pipeline, and Restorative Justice, followed by a panel of students. The event will also highlight Black owned businesses and organizations. Additionally, students at individual schools will be planning actions or events that will highlight and uplift Black student voice in intentional discussions of systemic racism, social injustice, Black history, self-worth, freedom, and justice. On that day, educators, students, and community members are encouraged to wear Black Lives Matter shirts or all black clothing to show support for our Black students and families.